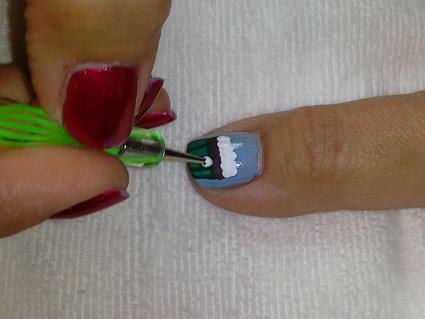 Nail art has quickly become part of the everyday manicure. Favorite foods such as cupcakes are fun ideas for whimsical designs. Whether you are going to a birthday party or just love cupcakes, you can easily add a cupcake to one or all of your nails. 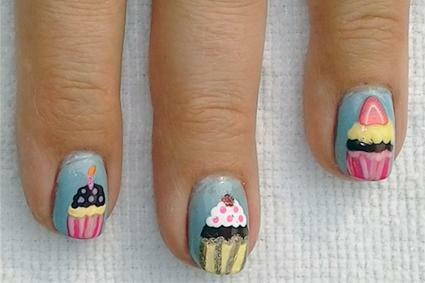 While cupcake nail art seems very involved and complicated, it really only requires a little time and a steady hand. Nail art pens can be used instead of brushes if you prefer. Use the quick dry manicure spray after every color, even if you're using acrylic craft paint, to speed the drying time. After applying one coat of clear base coat, select the background color and apply two coats. In this design, two coats of a baby blue shimmer nail polish were used. Select the cupcake wrapper color and apply two coats if needed. 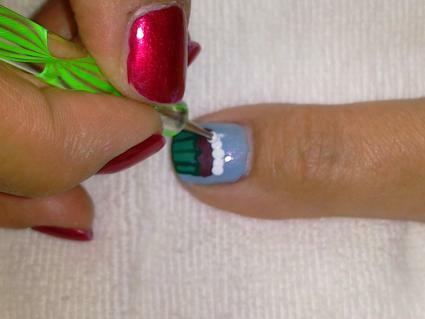 Paint a wrapper in a rectangle shape across the lower third of the nail. A jade green polish was used for this design, but you can make it any color. Using a darker shade of the wrapper color, such as dark green, and a fine detail nail art brush, add the outline and details to the wrapper body. To make the top detail of the wrapper, use the same color of polish. Angle the brush and paint a short diagonal line from the center of the detail lines up to the detail line behind the brush. This will make a small 'V' pattern between the top of the detail lines on the wrapper. To make the cake, pick a color to show the flavor, such as chocolate brown. Using the same fine detail nail art brush, follow the detail of the top of the wrapper. Then, make a semi-circle and fill in the cake. Acrylic craft paint should only need one coat. Nail polish will most likely take two coats to get the depth of color you want. Use a medium-sized dotting tool with white acrylic craft paint for the frosting. A toothpick can be used, but it will take more dots to get the same look. Make a row covering from side to side of the cupcake. Offset the next row of dots just a little. For the rest of the frosting, make the dots in a pyramid fashion. Then, you can go back and fill in or add more dots to make the frosting look fluffy. Every cupcake needs sprinkles. Pick colors that will go with the wrapper. Use a sharp point dotting tool or the very tip of a toothpick to add the sprinkles. Add just a few so as not to overwhelm the frosting shade with sprinkles. For the embellishment on top, add a drop of top coat where you want the embellishment. 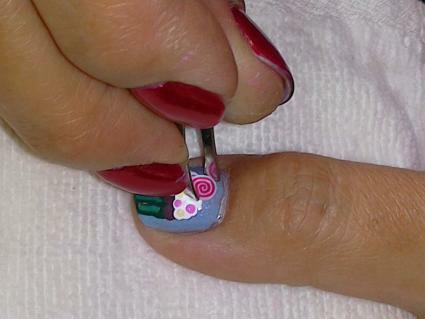 Use tweezers to pick up the embellishment and place it on the wet drop of top coat. This will wear for about a week. If you want the embellishment to stay until you take it off, use a drop of nail glue instead of the top coat. Alternatively, add a dot of red glitter polish for a cherry or a short, straight line for a candle with a short, diagonal line above it for the flame. When the cupcake is dry, add a clear top coat for shine and design longevity. 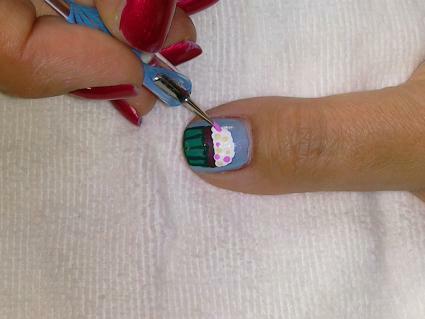 Women of all ages can wear cupcake nail art. It's not just for the young, but also for the young at heart. Use different colors to match your outfit, your favorite colors, team colors, or match the season or holiday. Show off your personality, whimsy, and your love of cupcakes with this basic design.